Many people today, including scientists, have the idea that oil and natural gas must take a long time to form, even millions of years. Such is the strong mental bias that has been generated by the prevailing evolutionary mindset of the scientific community. However, laboratory research has shown that petroleum hydrocarbons (oil and gas) can be made from natural materials in short time-spans. Such research is spurred on by the need to find a viable process by which man may be able to replenish his dwindling stocks of liquid hydrocarbons so vital to modern technology. The 1 March 1989 edition of The Age newspaper (Melbourne, Australia) carried a report from Washington (USA) entitled ‘Researchers convert sewage into oil’. The report states that researchers from Batelle Laboratories in Richland, Washington State, use no fancy biotechnology or electronics, but the process they have developed takes raw, untreated sewage and converts it to usable oil. Their recipe works by concentrating the sludge and digesting it with alkali. As the mixture is heated under pressure, the hot alkali attacks the sewage, converting the complex organic material, particularly cellulose, into the long-chain hydrocarbons of crude oil. However, the oil produced in their first experiments did not have the qualities needed for commercial fuel oil. So, the report says, in September 1987 Batelle joined forces with American Fuel and Power Corporation, a company specializing in blending and recycling oils. Together they have made the oil more ‘free-flowing’ using an additive adapted from one developed to cut down friction in engines. A fuel has now been produced with almost the same heating value as diesel fuel. The process from sewage to oil takes only a day or two! The researchers are now building a pilot plant. As the report states, potential economic benefits of this new technology are tremendous, since the process produces more energy than is consumed during normal sewage disposal, and the surplus energy products can be sold at a profit. Bonuses include an 80 percent reduction in waste volumes, and the eradication of poisonous pollutants such as insecticides, herbicides and toxic metals that normally end up in sewage. Of course, one cannot claim that this is the way oil could have been made naturally in the ground in a short time period. The starting raw material is man-made and hot alkali digesters don’t occur naturally in the ground. Of greater significance are laboratory experiments that have generated petroleum under conditions simulating those occurring naturally in a sedimentary rock basin. Between 1977 and 1983, research experiments were performed at the CSIRO (Commonwealth Scientific and Industrial Research Organisation) laboratories in Sydney (Australia). In their reports1,2 the researchers noted that others had attempted to duplicate under laboratory conditions geochemical reactions that lead to economic deposits of liquid and gaseous hydrocarbons, but such experiments had only lasted for a few or several hundred days, and usually at constant temperatures. Consequently, the differences in timescale and other parameters between geological processes and laboratory experiments being so great meant that scientists generally questioned the relevance of such laboratory results. Thus, in their experiments, the CSIRO scientists had tried to carefully simulate in a laboratory under a longer time period, in this case six years, the conditions in a naturally subsiding sedimentary rock basin. Two types of source rock were chosen for this study—an oil shale (torbanite) from Glen Davis (New South Wales, Australia), and a brown coal (lignite) from Loy Yang in the Latrobe Valley (Victoria, Australia). Both these samples were important in the Australian context, since both represent natural source rocks in sedimentary basins where oil and natural gas have been naturally generated from such source rocks, and in the case of the Bass Strait oil and natural gas fields, sufficient quantities to sustain commercial production. These two source rock samples were each split into six sub-samples, and each sub-sample was individually sealed in a separate stainless steel tube. The two sets of six stainless steel tubes were then placed in an oven at 100°C and the temperature increased by 1°C each week, After 50, 100, 150, 200, 250, and 300 weeks (that is, at maximum temperatures of 150°C, 200°C, 250°C, 300°C, 350°C, and 400°C), one stainless steel tube from each series was removed, cooled and opened. Any gas in each tube was sampled and analysed. Residues in each tube were extracted and treated with solvents to remove any oil, which was then analysed. The solid remaining was also weighed, studied, and analysed. The results are very illuminating. At less than 300°C, 35 percent of the oil shale had been converted to a paraffinic crude oil. At 350°C not only was generation of the oil complete, but ‘cracking’ of the oil had occurred extensively, with thermal decomposition producing 60% gas. In the brown coal samples, however, during the first 50 weeks of heating, gas (mainly carbon dioxide) was produced, and the production rate increased over the next 100 weeks. Virtually no oil was formed up until this point. Between 250°C and 300°C, when the oil shale generated copious oil, the brown coal produced about 1% short-chain hydrocarbons and 0.2% oil, which resembled a natural light crude oil (similar to that commercially recovered from Bass Strait, the offshore oil fields in the same sedimentary basin as, and geologically above, the Latrobe Valley coal beds from which the samples used in the experiment came). The products after 250 weeks (350°C) resembled a carbon dioxide rich natural gas. Over the same time period and at those temperatures, the brown coal samples had also been converted to anthracite (the highest grade form of black coal). The researchers concluded that overall, the four-year (300°C) results provide experimental proof of oil shale acting as an oil source and of brown coal being a source first of carbon dioxide and then of mainly natural gas/condensate. Significantly, these products of these slow ‘molecule-by-molecule’, solid-state decompositions are all typical of naturally occuring hydrocarbons (natural gases and petroleum), with no hydrocarbon compounds called olefins or carbon monoxide gas being formed. Geologists usually maintain that these processes of oil formation from source rocks (maturation events) commonly involve one thousand to one million years or more at near maximum temperatures.3 However, the researchers believe their series of experiments are the best attempts so far to duplicate natural, subsiding, sedimentary conditions. Extensive conversion of organic matter to hydrocarbons has also been achieved at less than 300°C under non-catalytic conditions with a minimum of water present. Furthermore, the researchers maintained that their experiments clearly show that altering the time-scale of source rock heating from seconds (the duration of many previous laboratory experiments) to years makes the products produced similar to natural petroleum. But could these laboratory experiments really have simulated natural petroleum generation from organic matter in source rocks in only six years as stated? Figure 1. The Location of the Guaymas Basin in the Gulf of California. 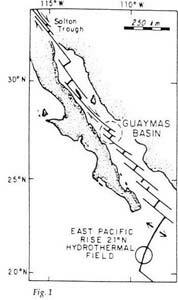 This ‘natural refinery under the ocean’ is found under the waters of the Gulf of California, in an area known as the Guaymas Basin (see Fig. 1). Through this basin is a series of long deep fractures that link volcanoes of the undersea ridge known as the East Pacific Rise with the San Andreas fault system that runs northwards across California. The basin consists of two rift valleys (flat-bottomed valleys bounded by steep cliffs along fault lines), which are filled with 500 metre thick layers of sediments consisting of diatomaceous ooze (made up of the opal-like ‘shells’ of diatoms, single-celled aquatic plants related to algae) and silty mud washed from the nearby land. Along these fractures through the sediments in the basin flows boiling hot water at temperatures above 200°C, the result of deep-seated volcanic activity below the basin. These hot waters (hydrothermal fluids) discharging through the sediments on the ocean floor have been investigated by deep sea divers in mini-submarines. 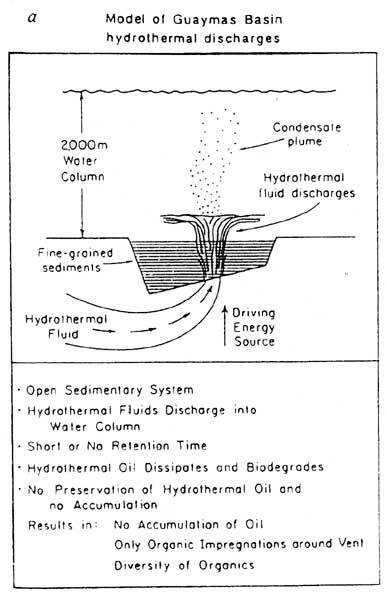 The hydrothermal activity on the ocean floor releases discrete oil globules (up to 1–2 centimetres in diameter), which are discharged into hydrothermal the ocean water with the hydrothermal fluids.7 Disturbance of the surface layers of the sediments on the ocean bottom also releases oil globules. Correct measurement of the oil flow rate at these sites has so far not been feasible, but the in situ collection of oil globules has shown that the gas/oil ratio is approximately 5:1. Large mounds of volcanic sinter (solids coalesced by heating) form via precipitation around the vents and spread out in a blanket across the ocean floor for a distance of 25 metres. These sinter deposits consist of clays mixed with massive amounts of metal sulphide minerals, together with other hydrothermal minerals such as barite (barium sulphate) and talc. This oil and gas has probably formed by the action of hydrothermal processes on the organic matter within the diatomaceous ooze layers in the basin. Of crucial significance is the radiocarbon (C14 ) dating of the oil. Samples have yielded ages between 4,200 and 4,900 years, with uncertainties in the range 50–190 years.11 Thus, the time-temperature conversion of the sedimentary organic matter to hydrothermal petroleum has taken place over a very short geological time-scale (less than 5,000 years) and has occurred under relatively mild temperature conditions. 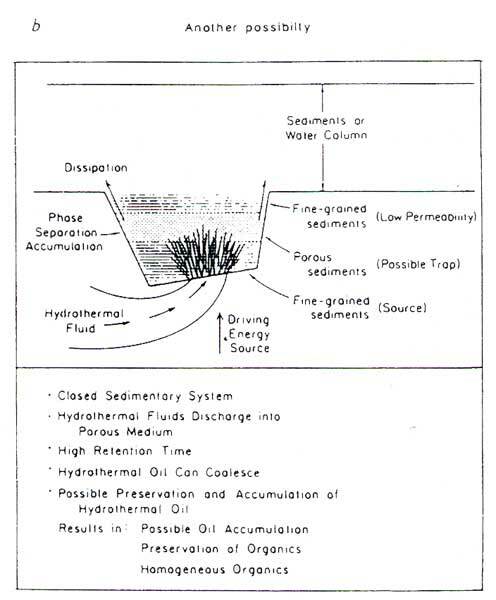 It is significant also that the temperature conditions in these hydrothermal fluids, of up to and exceeding 315 °C, are similar to the ideal temperatures for oil and gas generation in the previously described Australian laboratory experiments.12 Figure 2a illustrates the oil generation system operating in the Guaymas Basin, while Figure 2b shows how this process could be applied in a closed sedimentary basin to the hydrothermal generation of typical oil and gas deposits. The generally accepted model of oil generation assumes long-term heating and maturing of the sedimentary organic matter in subsiding sedimentary basins. The organic matter undergoes successive and gradual increases in alteration, leading to a process of continuous oil generation. The oil subsequently migrates to be trapped in suitable host rocks and structures. 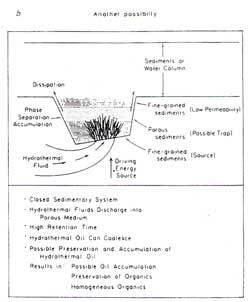 This multi-step oil formation process has a low efficiency and converts only a minor fraction of the original organic matter of the sediment to oil.13 There is difficulty in balancing and timing an adequate degree of oil generation occurring at intermediate stages in the sedimentary basin, and ample fluid available for adequate transport (migration) of the oil. Although considerable progress in the understanding of this multi-step oil formation mechanism has been achieved, there are still problems that need to be solved. Such a slow multistep mechanism differs significantly from hydrothermal petroleum formation. No evidence is so far available on the extent to which this alternative single-step oil generation process has contributed towards the origin of presently exploited oil reserves. Thus the rapid formation of oil and gas is not only feasible on the basis of carefully controlled laboratory experiments, but has now been shown to occur naturally under geological conditions that have been common in the past. 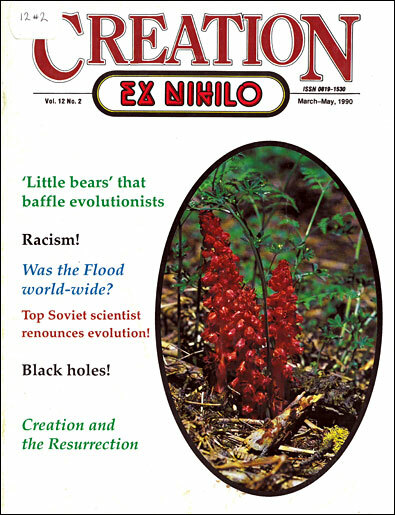 Significantly, these short timescales are well within those proposed by creation scientists for the generation of petroleum from organic matter in sediments laid down during Noah’s Flood. Subsequently, the discovery of the hydrothermally produced petroleum on the ocean floor in the Guaymas Basin of the Gulf of California is even more crucial to the case of the creation scientists and Flood geologists, when they argue that the fountains of the deep referred to in the Book of Genesis were probably vast volcanic upheavals that broke open the earth’ crust, pulverizing rock which was then scattered as volcanic debris, and expelling lavas, gases, and hot liquids, principally water. Indeed, the bulk of the volcanic products would have been superheated water, similar to the hydrothermal fluids found in the Guaymas Basin. The rock record contains many layers of volcanic lavas and ash between other sedimentary layers, many containing organic matter. 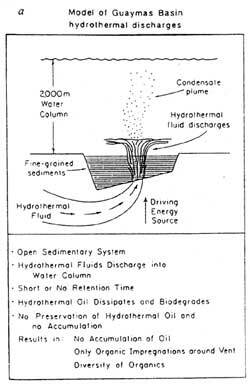 Thus this model for hydrothermal generation of petroleum is more than a feasible process for the generation of today’s oil and gas deposits in the time-scale subsequent to Noah’ Flood as suggested by creation scientists. Saxby, J. D. and Riley, K. W., 1984. Petroleum generation by laboratory-scaled pyrolysis over six years simulating conditions in a subsiding basin. Nature, vol. 308, pp. 177–179. Return to text. Saxby, J. D., Bennett, A.J.R., Corcoran, J.F., Lambert, D.E. and Riley, K.W., 1986. Petroleum generation: simulation over six years of hydrocarbon formation from torbanite and brown coal in a subsiding basin. Organic Geochemistry, vol. 9(2), pp. 69–81. Return to text. Saxby and Riley, ref. 1, p. 178. Return to text. Saxby et al., ref. 2, p. 80. Return to text. Simonelt, B.R.T. 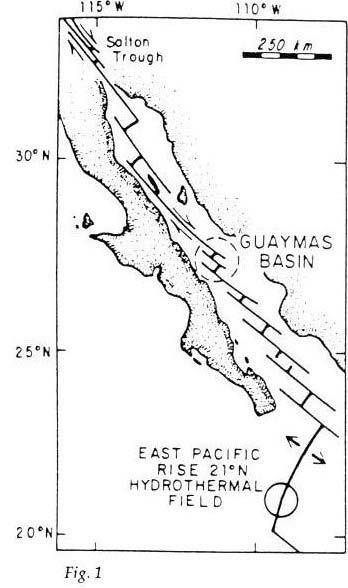 and Lonsdale, P.F., 1982. hydrothermal petroleum in mineralized mounds at the seabed of Guaymas Basin. Nature, vol. 295, pp. 198–212. Return to text. Didyk, B.M. 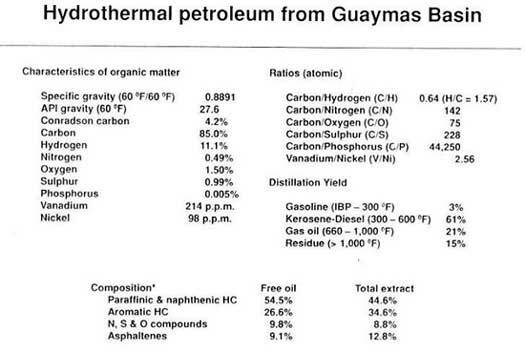 and Simoneit, B.R.T., 1989, hydrothermal oil of Guaymas Basin and implications for petroleum formation mechanisms. Nature, vol. 342, pp. 65–69. Return to text. Didyk and Simoneit, ref. 7, p. 65. Return to text. Didyk and Simoneit, ref. 7, p. 66. Return to text. Peter, J.M., Kawka, O. E., Scott, S. D. and Simoneit, B.R.T., 1988, Third Chemistry Congress of North America. Toronto, abstract GEOC 036. Return to text. Saxby et al., ref. 1 and ref. 2. Return to text. Didyk and Simoneit, ref. 7, p. 69. Return to text.